You need a good digital signage system when the weather is bad. Ok, I admit it… I geek out over digital signage. Why? because it’s really cool, at least to me. There’s practically nothing you can’t do with a digital signage player and a little time. It’s a great communications accessory, a great advertising tool… ok so it won’t cook you dinner but that’s about the limits of what you can’t do if you get the right player. As you probably know by now, digital signage is a new category of devices that replace those old message boards and bulletin boards with something new and high-tech. They take advantage of low-cost electronics used in tablets and computers, plus the fact that TV prices are insanely low. The players themselves are tiny and inexpensive, and mount easily behind a TV. 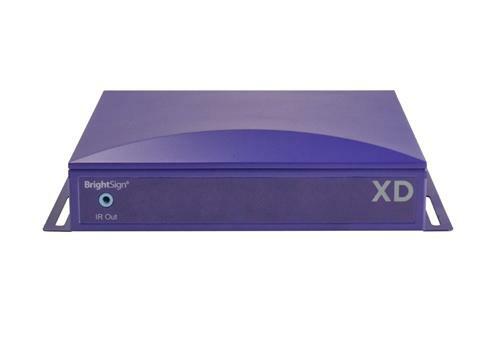 My personal favorites are the Brightsign players we offer at Solid Signal. Why? Because they’re network-connected (some even have Wi-Fi) and easy to program from literally anywhere on the planet. Your presentations are stored in the cloud so you can make the changes you need and have every player in your business update quickly. That’s especially important when it comes to bad weather. It’s not enough to send an email to people telling them that the roads are bad, and it’s certainly not enough to tell your customers when there are going to be delays. The sad thing is that we don’t think of email as a “must-read” medium anymore. Text messages are great to keep in touch with friends but they’re not really designed for business either. When you want to tell your employees that Interstate 94 is closed due to snow, you need to get their attention. That’s where digital signage comes in. A player and a TV put near the exit door, one in the lunchroom, and one near the elevators will get the word out with a clear, sharp graphic that gets people’s attention yet doesn’t intrude on them the way that using a public address system would. Digital signage players can be put in all your warehouses to help them communicate with each other and help everyone stay on the same page when there’s severe weather threatening to create shipping delays. Digital signage can warn people when it’s dangerous to walk in the parking lot, too. The best part of course is that one person working at a desk or on a tablet anywhere in the world can upload to a connected player and no matter where that player is, it will show the updated information in 5 minutes or less. That’s something special that Brightsign brings to the market and that’s one of the reasons I’m so bullish on them. Brightsign players are, of course, available at Solid Signal, and be self-installed with just a minimum level of understanding of computers and TVs.